Would you do a DEVIL’S DEAL for Oregon Football? I remember thinking about it and saying to myself, “Yes, I would take the Devil’s Deal.” Would you? Interesting! Would you take it? 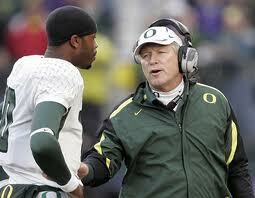 Mike Bellotti and Dennis Dixon raised the bar for our hopes as Oregon fans. As you recall from a prior article, only about a quarter of NCAA Division I teams achieve this objective, so it is actually a good, respectable long-term record. Some would say it would be the best long-term record for a team like Oregon, considering the recruiting disadvantages, being out of the prime time zone and being geographically far away from the focus of most college football fans. Being in the Rose Bowl and the National Championship games was so cool, yet we had to suffer for years as Oregon fans leading up to those. Is the frustration worth it? This past year, Coach Willie Taggart came along and showed us what could be done in recruiting–that it is possible to do so much more. Mario Cristobal will not match Taggart’s recruiting levels this year, but Coach Mario will still break the recruiting record, and he promises even greater results next year and beyond. Thus, perhaps the frustration in the near term will pay off for fans in the next five years. Should we skip the Devil’s Deal, gulp hard and cross our fingers? I love that clip, but it does raise that interesting question: Would you take the Devil’s Deal or not? One of the fascinating aspects of running this site is reading emails from fans, and over the years I’ve had some dandies. One Auburn fan and I took our argument off the message boards and engaged in a intellectual sparring match before the ‘Natty in 2010 by email that began nasty and vicious. During the back-and-forth, we got to know each other a bit, and I grew to like him, as he turned out to be completely reasonable, rational and very, very intelligent (he was an engineer/supervisor/manager for a company). He was just a big fan of his school, as we are for our beloved Ducks. Additionally, he was a superb writer who wrote with such emotion, yet such logical reasoning. I loved reading his emails–even if I disagreed with them. Then, after we both agreed to disagree and let our hair down, he admitted something to me that made me aghast. I could not believe my eyes … he would put up with knowing they cheated if they could win just one NC? It was worth that much to him? Well Oregon fans … after being in the Natty twice without winning, being one De’Anthony Thomas block away from getting to another, suffering through 4-8, 7-6, and who-knows-what more football seasons before Oregon gets there again, how about taking that Devil’s Deal? Let’s assume a scenario in which you know Oregon cheats but will not get caught, just as the Auburn fan wished. Would you still take the NC? One of Brian Libby’s superb books at Amazon.com. Most would say “no,” as they want to win fair and square, but ten or fifteen years later? Who remembers the “cheating” stuff? All they remember is that you won, and if you don’t believe that, ask Husky fans about their cheating, mythical NC back in 1991. The only people who recall their cheating now are Oregon fans like you and I. Is the cheating worth it to you? Look, I love to ponder this stuff in the off-season, as you can really think through the elements of the debate without the distraction of the regular season. I was kicking this around on the phone with fellow “Greybeard” and contributor to FishDuck.com, Brian Libby. 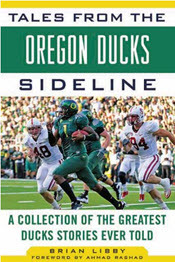 He is an Oregon Football historian with many books to his credit, and his passion for the Ducks and his moral standards were as equally challenged in these two dilemmas as they were for me. Omigosh. I cannot imagine that pain of those seasons after reaching the pinnacle, and who knows why it happens, but just play along with this “Bizarro World” scenario and tell me … is it worth it to you? One may ask why we are torturing ourselves contemplating such Devil Deals, but this stuff happens in real life, and we have lived aspects of the situations described above. What is your line between morals and a National Championship? How much pain could you endure as an Oregon fan? And this is assuming you do not know in advance that, after winning that ultimate National Championship, 20 years of misery awaits you. Why do we ponder such Devil Deals? The reason is because of above; how can you watch that short video and not have the same passion for the Ducks (and the lump in your throat because you feel the same as I did)? That was a very hard video (above) to record the audio for. We did four “takes” before I could get my emotion under control. I burst out almost crying during the first take, as I was unprepared for the feelings that would bubble up when verbalizing the script I had written. It was years of frustrations and hopes finally realized, and I was very, very grateful. 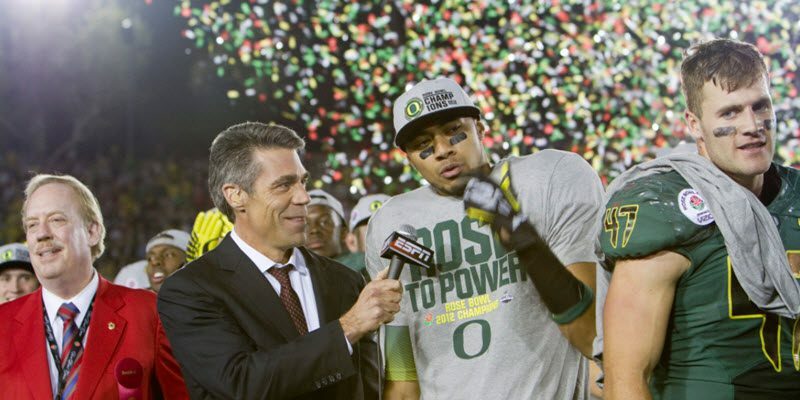 You and I–we have so much in common as devoted Oregon fans. Would you take any of the Devils Deals?